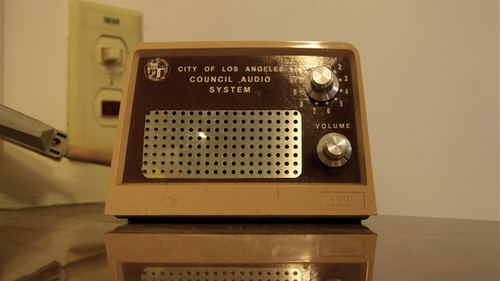 City of Los Angeles Council Audio System in the City Hall Media Room. YOUR ATTENTION PLEASE, YOUR ATTENTION PLEASE: Do not be alarmed, Today is Earth Day in Los Angeles . .–– Metro will hold "Rock & Ride” with eco- rockers "Canon" on the South Patio of Union Station at noon. You will need a valid Metro Pass or ticket to attend . .–– New Green: Grand Ave Commitee offers the public a peek of the new Civic park at the Dorothy Chandler Pavilion's Grand Hall at 6pm. Expect a lot of reports. . . –– STAMP ACT: It's Ruben Salazar Day in the City of Los Angeles. 15 TO GO: Both your Los Angeles Lakers and those Boston Celtics won their first 2008 NBA Playoff game, taking took one small step forward to once again meeting in the Finals . . –– I know, it’s too early to dash to Kinkos and print up Anti-Celtics banners, but doesn’t the idea of a revived rivalry make the playoffs more interesting? I [HEART] ROBOT: Downtown's Nic Cha Kim penned Lodestone Theatre first sci-fi play, "Trapezoid", a story about a robot falling head over heels with its human creator. The results are poetic, comic and tragic. . . –– Call it heartificial intelligence. CHO-LO-SPHERE: Latino Bloggers met at El Gallo Cafe on the Eastside last night, and topics went from taco trucks to Wendy Carillo checking up on Laura Chick after Mayor TV's talk to the city. We Need Laughs: Daniel Hernandez links to a very funny Anjelah Johnson . . –– Art District's Melissa Richardson reports of watching Cheech Marin, whose Chicano Art collection Richardson has curated for several exhibitions, be back on a stage with Tommy Chong for a panel discussion after a screening for "Up in Smoke" at the ArcLight. . . –– Speaking of High: One idea from the Latino Bloggers meeting was to rally taco trucks and cruise the Eastside in solidarity to protest Molino's curfew . . .each with a Man One mural emblazoned on the side. SPEAKING OF MAN: More support for the Man One from LAO's Chicken Corner linking to Nature Trumps., adding to the coverage from here and elsewhere . . –– Add Ripple of Disbelief: Man One was on the April 17 Getty panel "The Arts in Los Angeles, 1997-2007" with Steven Lavine, president of CalArts, Christopher Hawthorne, architecture critic for the Los Angeles Times, Olga Garay Executive director of the City of Los Angeles Department of Cultural Affairs, and Catherine Gudis, associate professor of history at UCR. . .–– It was only a few days after his graf mural project was whitewashed, and when Man One recalled the story of the work painted over, the audience gasped. . .–– I gasped when I realized Man One was the only native Angeleno on the panel.